Imagination really is the key to unlocking all of the abundance you have in store for you. It could not be better to be able to sit-back and allow the right love life to walk right up to you instead of running around chasing the experience of your dreams. Using your imagination for such a thing can be tricky because you’ve got to spend all your momentum believing in what it is that you are bringing into your life before you actually see it. Like with anything. If you set the intention for a particular outcome and then get sidetracked, the original intent cannot come through. What courage it takes to believe in your own dream and wow, so much more to even know what that dream is in the first place! I just had an example of this with the sale of my vintage trailer. I have always been a nomad and this was something very dear to me which had served me well. When I decided to sell, I set the intention to make the sale in a certain time-frame. When the first real buyer came along, I jumped on the sale though compromised my original intention. No sooner than I had made my verbal agreement with her but another woman contacted me, begging to buy it at top value wanting to have it out on the road in a women’s group, driving their gypsy wagons across the desert plains. I had already made an agreement, so I kept my word, studying and watching all the while how indeed choosing the compromising option eventually cost me a lot of extra time, the very reason I had made the compromise in the first place. When applied to attracting the right love relationship, this example is ultimately potent. As you can see, there are many dynamics at play so let’s try to uncover some of the details. 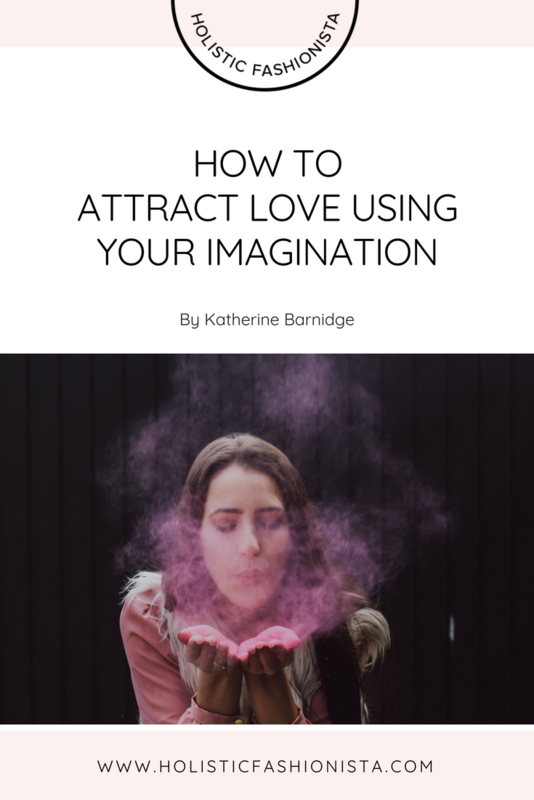 The key with the ability to using your imagination to create the love life you desire is to be able to see the details, slow them down and look at them individually so that you can make changes in your own mind, your own heart and to your own longings. The first task is to heal from your past and bring yourself into the vibration of your desires. This can be quite a process though if you have a real dream, it’s worth investing everything into to give it the best possible chance of becoming your life. If you are needing deeper healing, I recommend to seek out all the help you can find so that you can gain the spiritual movement you need to be able to create what you authentically are, free from the baggage of your past. The second step is that you must imagine your love life; see it, feel it and taste it. You have the ability to do this in any format though its wonderful to create a container for your intentions. For this, I recommend imagining a translucent, clear bubble out in front of you. Inside of this buoyant sphere you may place for yourself all of your wishes. You may specifically see yourself enjoying them, for the time frame and configurations you want. Keep this sphere sacred, just for the part of your life containing the love you imagine for yourself, allowing all other features of your life to simply fall away, out of the sphere. See your intimacy, see your communication style, see your ability to resolve conflicts and disagreements while even imagining any circumstance you want for your first meeting and see the ultimate future goals you want in partnership. Visualize the colors that represent that love for you, making them translucent no matter how deep the tone. See words, hear the sounds and taste the fruits of your wildest dreams filling that sphere full to the brim with the song of yourself. Thirdly, allow others their autonomy and ability to choose to be a part of your love intention. If you are longing for a lover you already know, someone you’ve been with, want to be with or sense that you should be with, consider what it means to give them the option to participate in what you create for yourself. Sense the power in that space you give. Deep inside its resonance is the statement that you will have what you want, as you want it, without demanding anything from anyone. Take a moment to revel in this powerful tone and see the clarity it draws to your sphere. Imagine now, that you reach out with your hands and hold your sphere between them, appreciating your work. Slowly draw it into your chest and allow it to change the feeling of your body as it begins to radiate from within you. Feel it’s force of magnetism and the way it makes room for your dream and intentions, moving aside anything that no longer fits into your plan. Allow yourself to vibrate here, soaking in your own presence and for the next 72 hours pay attention while your fresh desires become the very cells of your body. If you do not see your best results the first try, begin again from the beginning and reaffirm your beliefs in your own desires. Move past self-doubt and choose to continue your healing practices, clearing and cleaning your past. Return again, renew your intention for your own passion, love, connection, intimacy, peace, contentment and joy in the love life of your dreams. Hold steady inside of yourself, deep at your core and focus on only what you want to see. You are powerful beyond measure and anything standing in your way is simply old build-up you’ve collected, even if it feels personal to you. You belong now, in your own dream and there are wonderful, practical ways to stretch your imagination in order to embody it all.